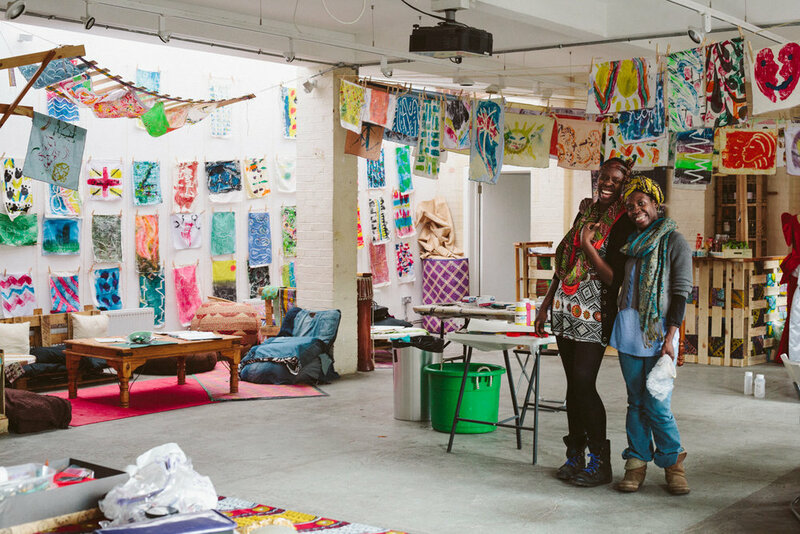 In October 2014 we were awarded a month residency as part of MBE Yinka Shonibare's Guest project Africa initiative. We grew up with sweet potato topping our cottage pie and fried cassava accompanying our battered cod. We are a product of the mash-up of two strong cultural influences nurtured and natured. At The AFRORETRO School of Uganglish we explored our cultural mash-ups, giving an exclusive invitation to all to dip their toes into our version of Ugandan-ness and boy did you all bring your own cultural mash-ups. Everyone and their complex cultural make-up was welcome. People came to share their own journeys, those of their ancestors or to see if another culture fitted them better! We commissioned 1 Lebanese, 2 Ugandan, 3 British creatives and our Mum to experience their creative discipline through different eyes, ears, hands, tongues and noses. We worked to recreate the cultural clashes and partnerships that we have experienced in our own personal journey and let them manifest and inspire through others. "The School of Uganglish explored what it is to be part of the 1st generation Ugandan Diaspora living in England." It just so happened that The School of Uganglish opened its doors on Ugandan Independence Day! 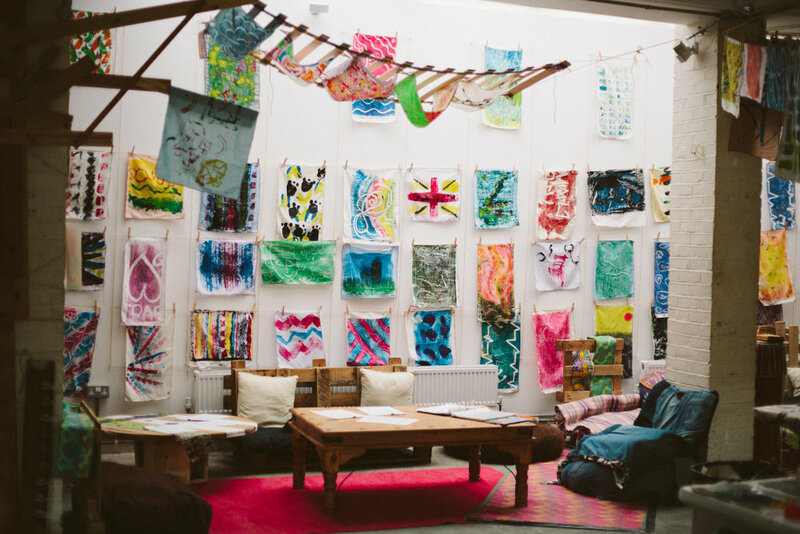 Throughout the month we held drop in Mono Print your Life workshops. African Fabrics and textiles tell more than a story of just nights out and sashaying down the high street. These fabrics are full of messages of politics, aspiration, history and culture. 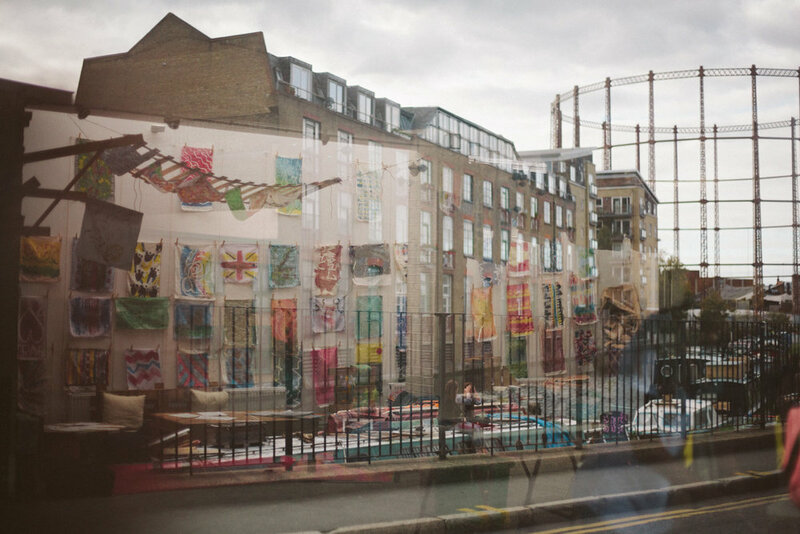 We invited London and anyone passing to bring THEIR politics, aspirations history and culture to create their very own textile print. Turning an empty white space into a mass of colour and energy. Filled with the stories and culture of all that walked through the doors. We commissioned 2 drummers one from Jinja Uganda and one from Macclesfield, England to collaborate to create their very on Uganglish beat. Together with musician Dan Cater-Hope and The Iyatra Quartet they learned the beats of The Busoga Drum and the Talenga Clan to create 3 new tracks and an improvised music set. This was performed alongside a drumming workshop and improve music session. Throughout the month we held drop-in workshops, mono-print the story of your life, weave a book mark, sew a funky lavender bag, craft yourself a oyster card wallet from fabric stripped from the inside of a tree, weave a greeting card or just sit chill watch the world get crafty while relaxing in our upcyled bar. The Kitchen was open serving Ugang-banese dishes created specially for our Ugangslish supper club. We held an exclusive Weave-Tee workshop-Ugandan style! We helped a group of sewing newbies to turned an old unwanted T-shirt into a statement fashion item ready to rock out just in time for the party season. Juliana Yazbeck, a Lebanese-American, food-blogger, cook and all-round food enthusiast created a mouth-watering three-course menu of Ugandan-Lebanese fusion dishes. Thanks to the culinary wisdom of Mama Joy Bafumba, Juliana was taken on a crash-course in traditional Ugandan cooking over a month in the run-up to The School of Uganglish residency. Armed with her own mother’s (and grandmother’s) cooking knowledge, Mama Joy’s expertise and her own crazy love of food, Juliana’s menu was full of flavour, culture and love and like nothing you have ever tasted before! WE GOT OUR BSL ON! As keen British Sign Language users (Level 2) and supporters of The Deaf community. We had a fully qualified BSL interpreter attend one of Mono Print Your Life and Craft cafe evenings! WE ENDED THE MONTH WITH OUR GRADUATION UPCYCLED CATWALK SHOW! FOR OUR GRADUATION FINALE WE HEARD THE MUSIC FROM OUR DRUMMING RESIDENTS WILL & SIMON, SHOWCASED OUR UGANGLISH DESIGNS FROM MARY AND LAUNCHED OUR FIRST CATWALK COLLECTION! We would like to extend a heart felt thanks to everyone who made the school of Uganglish possible from everyone who attended an event to friends near and far that shared a link or tweeted a message of support. To our all our Kickstart Supporters we couldn't have done it without you, you put your money where your mouth was and gave us the courage and support to take this the full hog! So thank you to Alexander White, Michael Alpha, Fran Scott, Richard Dicky Earl, Rachel Valentine Leipacher, Liz Barlie, Leah Hargreaves, Joy Alpha, Laura Tutt, Katie Burke, Carlos Izsak, Wendy Albiston, Kay Ness, Tim Bell, Elspeth Crilly, Karla Spencer-George, Jin, Anais Teupker, Emma Jane, Micol, David, Katy Poulter, Bronya Deutsch, Chloe Massey, Michael, Daniel Carter-Hope, Kate Sawyer, Bettyna Jones, Alex Guiney, Robin Browne, Elizabeth Twells, Annie Saunders, Paul Williams and David Johnston. To our wonderful models, who rocked AFRORETRO's first collection with such bold fierce beauty. You all looked gorgeous and made us feel so proud. So thank you to Alim Jayda, Justin Alpha, Clare Barratt, Rochelle Rose and Elfriede Kormawa. Also a special thank you to Alim who choreographed the models and gave them a special swagger to rock it to! To all our midnight helpers; who drove around east London picking up discarded pallets from the street, to Lambeth Freecyclers who donated fabrics for printing and old bed frames which we made into a bar,to those who came and help supported us during workshops, Interpreted our Uganglish message into BSL, sewed buttons on in the final minutes, picked us up from deepest darkest East London, interfaced, stitched, mopped, gave hugs when it felt like too much, danced and ate 1 am pizza when we were glowing from our achievements, donated wonderful Gin we want you to know that without you it wouldn't have tasted so sweet, so thanks to Dan Hope, Leah Kafuko, Kimbo Silver, Afia Weller, Clare Barratt, Becky Allen, Nadia Nadarajah Rochelle Rose, Claire Hazel, Deanne Nuula, Jonny Neill from Whitley Neill and Mark from The Red Church Brewery. And last but no means least to MBE Yinka Shonibare and the Guest Projects Team to creating a space where ideas and dreams can not only live but thrive!